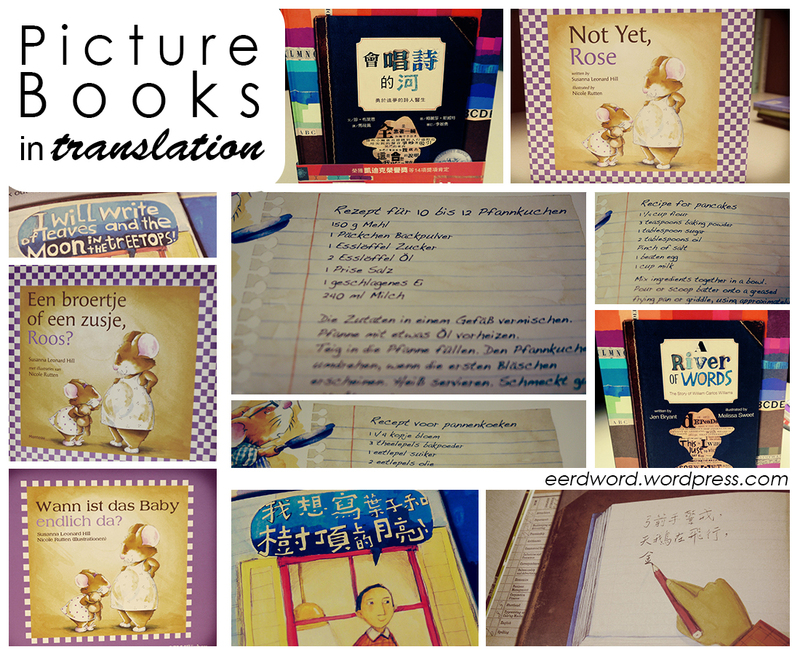 Eerdmans picture books in translation: Not Yet, Rose (into German and Dutch) and A River of Words (into Chinese). Picture books make excellent cultural ambassadors. That’s what the folks at Eerdmans Books for Young Readers firmly believe, at least. This week on EerdWord, we’re celebrating “picture book diplomacy” with EBYR. Today we hear from subsidiary rights manager (and soon-to-be new dad) Tom DeVries, who shares his perspective on Eerdmans picture books that have made their way into the hands of children in Germany, China, and beyond. Susannah Leonard Hill and Nicole Rutten’s Not Yet, Rose, translated from English into Dutch and German. If you are a regular follower of Eerdmans Books for Young Readers you will have noticed that we publish a large number of English translations of picture books that first appeared in other languages. What you may not know about are the number of our children’s picture books that are translated from English into foreign languages. EerdWord featured a blog post from me about the many translations of Merrill Tenney’s New Testament Survey a while back. What I did not talk about there was how different translations of our children’s picture books are compared to our adult books. If you have ever done any translations of poetry you can certainly appreciate how difficult it is to get words, phrases, expressions, ideas, and meter in another language that still conveys the same message and tone of the original work. This kind of poetic, short, pithy language appears often in our picture books. Additionally, the artwork for our original books can sometimes be simply “too American” for international audiences. However, as you can see by the beautiful images of translated Eerdmans books in this post, publishers from around the world do regularly take on such work. Jen Bryant and Melissa Sweet’s A River of Words, translated into Mandarin Chinese. As an anecdote, the story of the Chinese translation of A River of Words is particularly illuminating. This book is an award-winning picture biography of William Carlos Williams, a doctor and poet from New Jersey who died fifty years ago. Not exactly a known figure around the world. However, the captivating illustrations by Melissa Sweet and the engaging story told by Jen Bryant, along with the original poetry from Williams caught the attention of a literary agent in Taiwan with whom I work from time to time. From that little spark, a push to translate this book developed. Soon enough the agent located an art house publisher in Taiwan who would take on the project. So a picture book biography of an American poet is now available in Chinese for readers who might never have known about William Carlos Williams. That kind of cultural sharing is exactly what we are all about here at Eerdmans. Click to order (English editions of) Susanna Leonard Hill and Nicole Rutten’s Not Yet, Rose and Jen Bryant and Melissa Sweet’s A River of Words. Click on the images in this post to view larger versions.